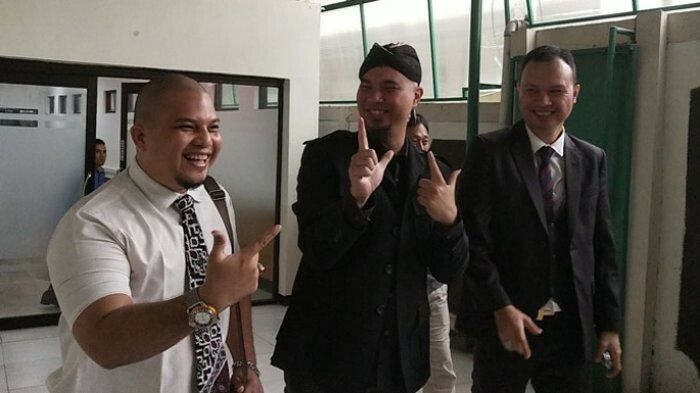 Singer-songwriter and Gerindra Party politician Ahmad Dhani, who was convicted of hate speech last month, will be transferred to Sidoarjo, East Java, on Wednesday to face another hate speech trial in relation a vlog post in which he called his political rivals “idiots”. “[Dhani] is expected to be transferred on [Wednesday] afternoon,” East Java Prosecutors Office legal spokesperson Richard Marpaung said as quoted by kompas.com on Wednesday. Shortly after the administrative process for the transfer is finished, Dhani will depart from Halim Perdanakusuma Airport in East Jakarta to Juanda International Airport in Surabaya. He would be taken to Medaeng Penitentiary immediately after his arrival, Richard said. Dhani has been sentenced to 18 months in prison for hate speech in connection with a tweet that incited people to attack supporters of former Jakarta governor Basuki Tjahaja Purnama, who now prefers to be called “BTP” but was famously known as “Ahok”. The brains behind the band Dewa 19 and the supporter of presidential candidate Prabowo Subianto, who is challenging President Joko “Jokowi” Widodo’s reelection bid, was found guilty of violating Article 45 of the Electronic Information and Transactions (ITE) Law. Last year, Dhani was reported to the police by a coalition calling itself Defend NKRI (Unitary State of the Republic Indonesia) after the musician called those who opposed the 2019 Ganti Presiden (2019 Change President) declaration in Surabaya “idiots” in his vlog.